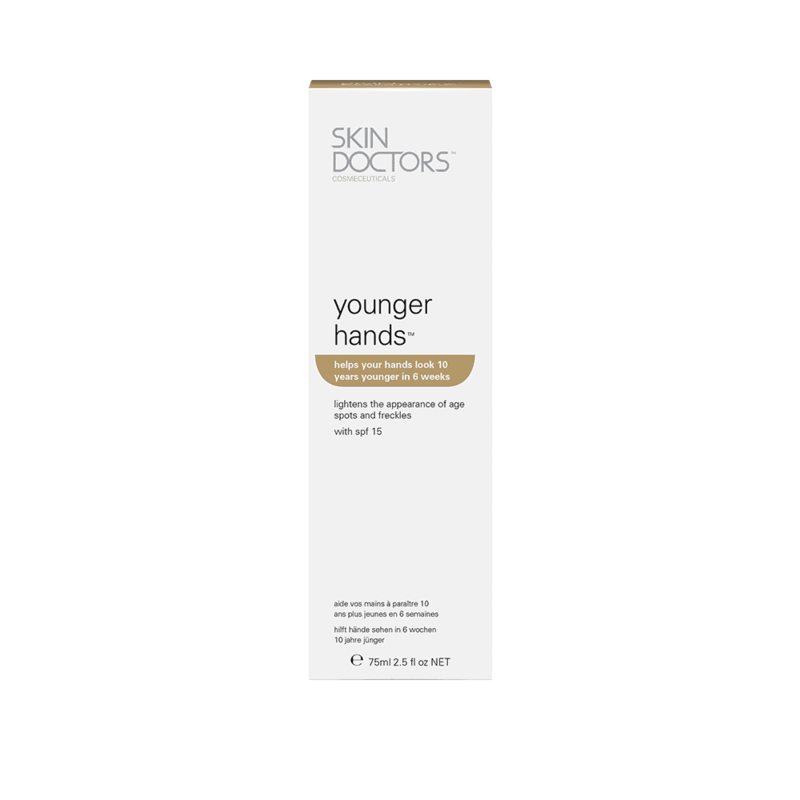 Skin Doctors Younger Hands is a breakthrough anti-ageing hand treatment. 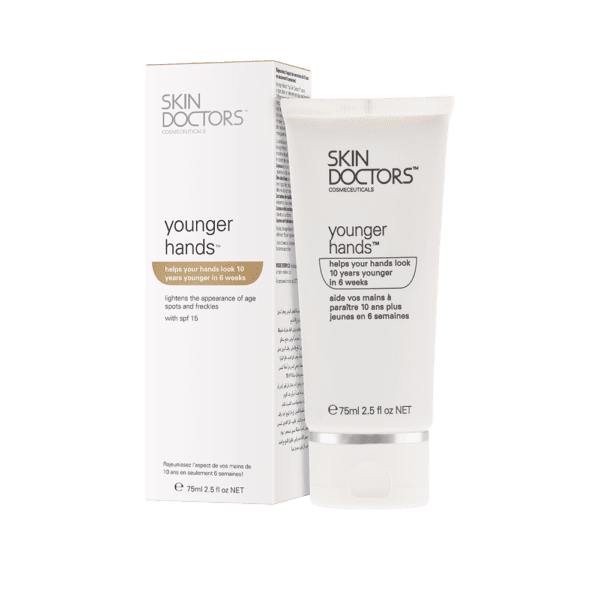 Unlike normal hand creams, designed primarily to moisturise, Younger Hands contains 4 clinically proven actives for dramatic, anti-ageing results. It has been specifically developed to treat the back of the hands where damage and ageing are most noticeable. 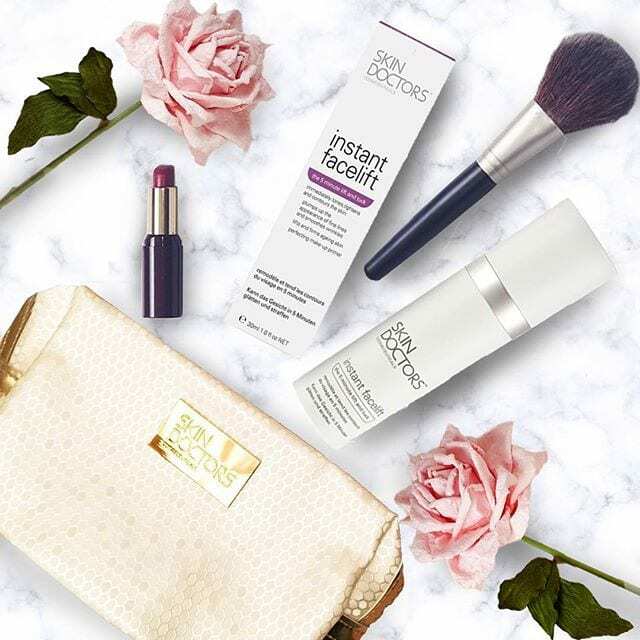 Contains SPF 15 UVA/UVB protection to help prevent further ageing. 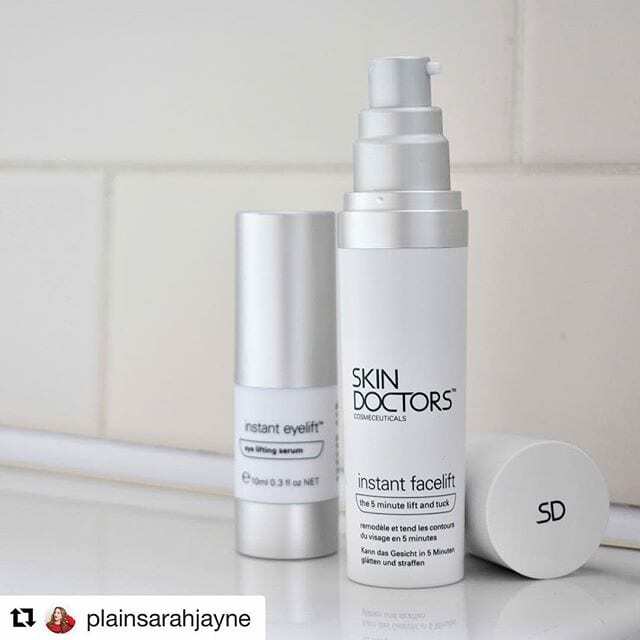 Line Factor 10– mimics the natural ability of the extra cellular matrix thereby improving the cell renewal process of the skin. It also increases skin firmness and skin density, improves skins texture, reduces creping, plumps and smoothes the skin. Phyllanthus Emblica– also known as Emblica or Indian Gooseberry, this plant is native to tropical Southeast Asia. It is a skin-lightening, pigment-reducing agent, giving skin a bright and even colour. Emblica is also a potent anti-oxidant, eliminating free radical damage to the skin, helping to achieve a youthful appearance. Lactic Acid– a type of Alpha Hydroxy Acid, naturally occurring in milk. 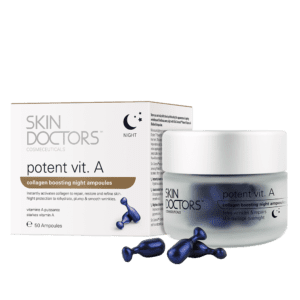 Lactic Acid gently exfoliates the skin and has been shown to increase the water-holding ability of the skin, allowing for increased hydration and an improvement in fine lines. Uniprosyn PS18– A bioactive complex that reduces skin roughness by increasing protein synthesis and hydrating the skin. 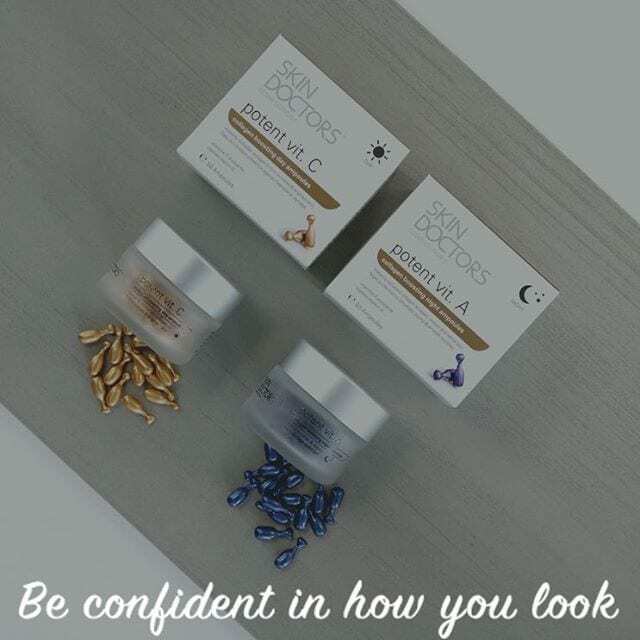 It also reduces the appearance of wrinkle depth in aged skin. Sunscreen Filters (SPF15)– UVA/UVB sun protection – to protect against further ageing and sun damage. 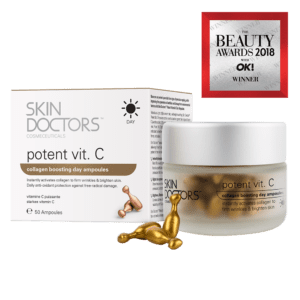 Ingredients: Water (Aqua), Lactic Acid, Ethylhexyl Methoxycinnamate, Glyceryl Stearate, Cetearyl Alcohol, Phyllanthus Emblica Fruit Extract, Butyl Methoxydibenzoylmethane, Butylene Glycol, Sodium Hydroxide, Niacinamide, Cyclopentasiloxane, Hibiscus Abelmoschus Seed Extract, Hydrolyzed Oat Protein, Xanthan Gum, Disodium AdenosineTriphosphate, Stearyl Alcohol, PEG-20 Stearate, Potassium Cetyl Phosphate, PEG-100 Stearate, Cyclohexasiloxane, Ceteareth-20, PEG/PPG-18/18 Dimethicone, Disodium EDTA, Phenoxyethanol, Methylparaben, Butylparaben, Ethylparaben, Propylparaben, Imidazolidinyl Urea, Fragrance (Parfum), Citronellol, Hexyl Cinnamal, Linalool, Butylphenyl Methylpropional. 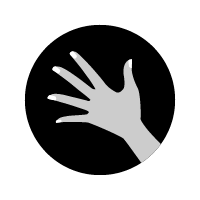 Skin on the hands can often look more aged due to high exposure to sunlight on very thin skin. This delicate skin on the hands are often overworked and unprotected, causing dryness, sagginess and dark age spots. It is important to protect your hands therefore that is why Skin Doctors Younger Hands contains active ingredients which work make your hands look 10 years younger in just 6 weeks and includes includes SPF 15 to prevent any further damage occuring. Q) How Does Younger Hands Work? A) Younger Hands contains several actives ingredients that combine to address the most common skin problems on the hands – fine lines and wrinkles, age spots, uneven skin tone, pigmentation, dehydration, sun damage and loss of elasticity. 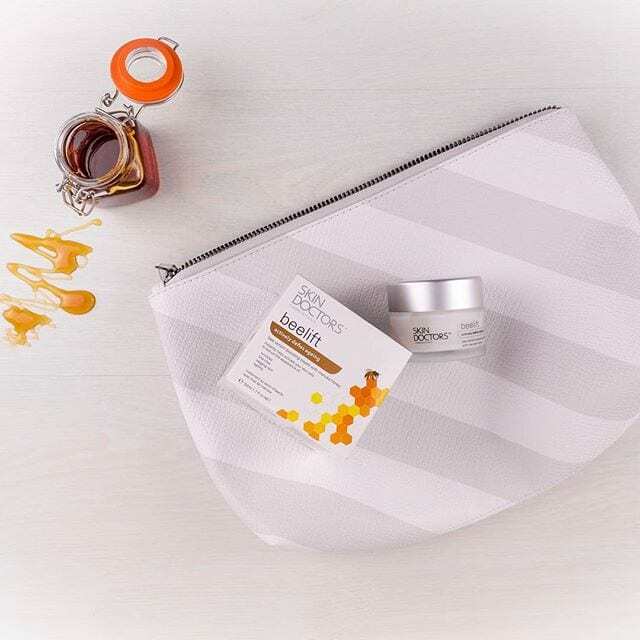 Q) How is Younger Hands different to other hand creams? A) Unlike normal hand creams designed only to moisturise, Younger Hands contains 4 clinically proven actives for dramatic, anti ageing results. It has been specifically developed to treat the back of the hands where damage and ageing are most noticeable. 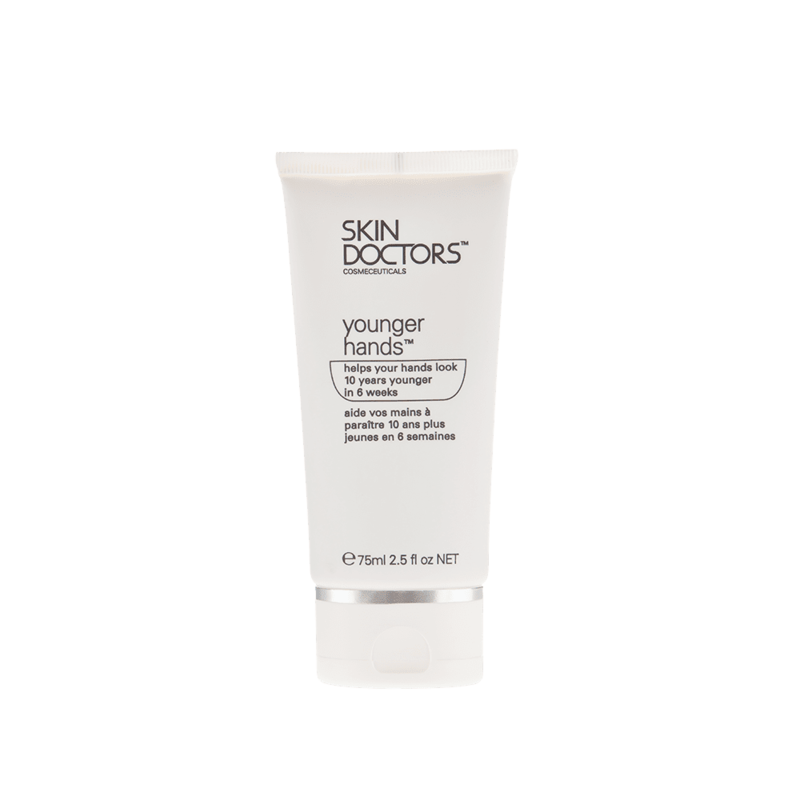 Q) Does Younger Hands contain an SPF? Repeat at night before bed. Excellent product. 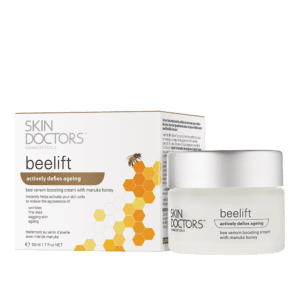 Softens and smooths skin. Leaves my skin feeling calm, soft and gradually restoring it`d youthfulness.